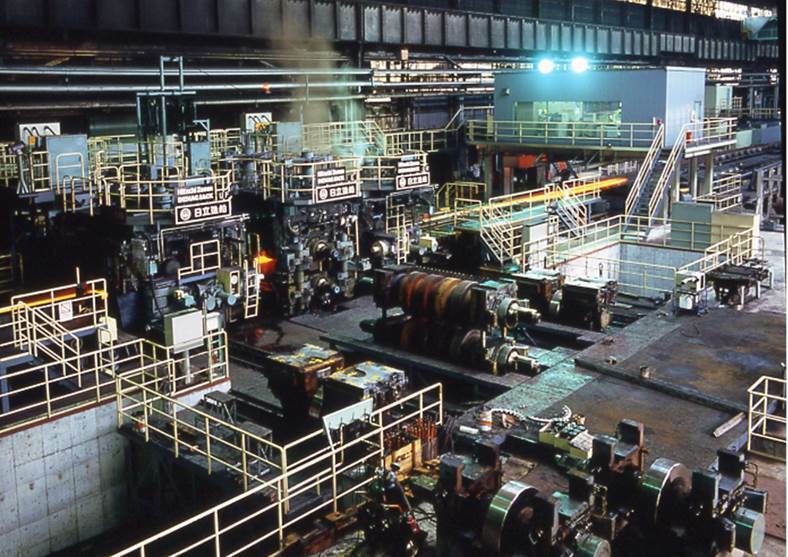 Rolling mills are facilities that carry out a series of processes including rolling the billets, blooms, slab and beam blanks – extracted from the reheating furnace – into the prescribed size and correcting any bending, cutting them into given lengths, then piling or bundling as needed for shipment. 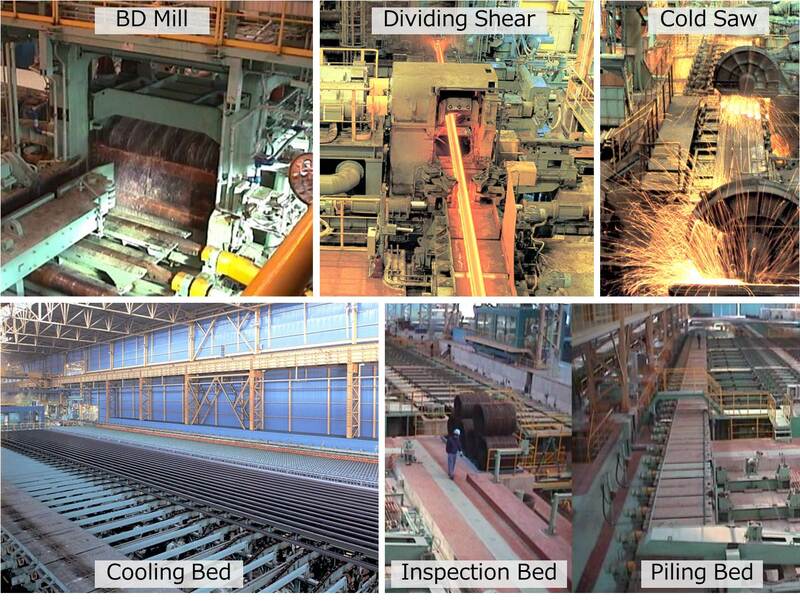 The rolling mills offered by Steel Plantech, with its rich track record of supplying steelmakers in Japan, can meet demanding requirements in terms of production efficiency and product precision. 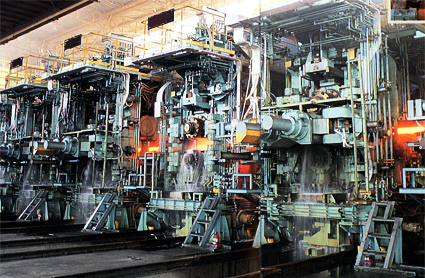 Steel Plantech has accumulated a rich track record in all types of rolling mills. 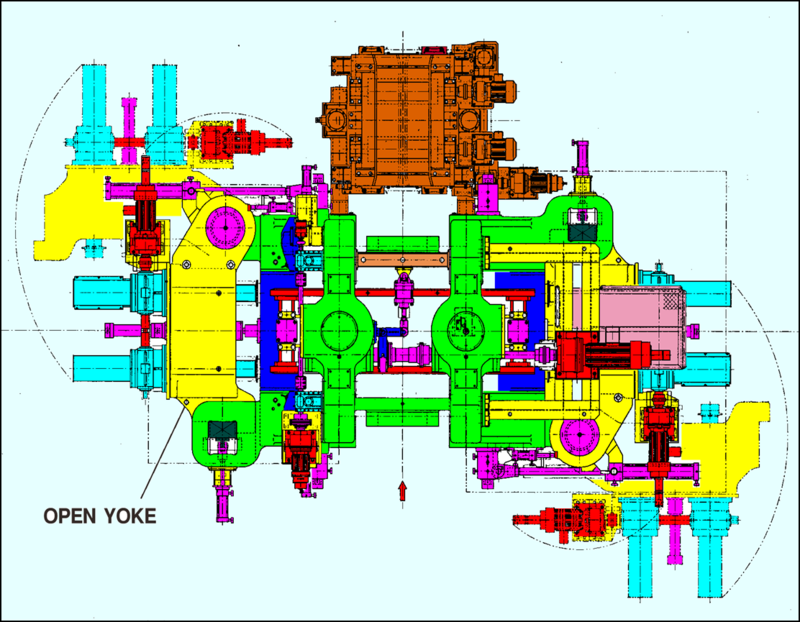 Using this as a basis, we can design and propose flexible rolling mill lines that are suitable for various plant layouts. Furthermore, by carrying out equipment diagnosis of your existing rolling mill, we can examine the possibilities regarding the expansion of your production sizes and steel grades. 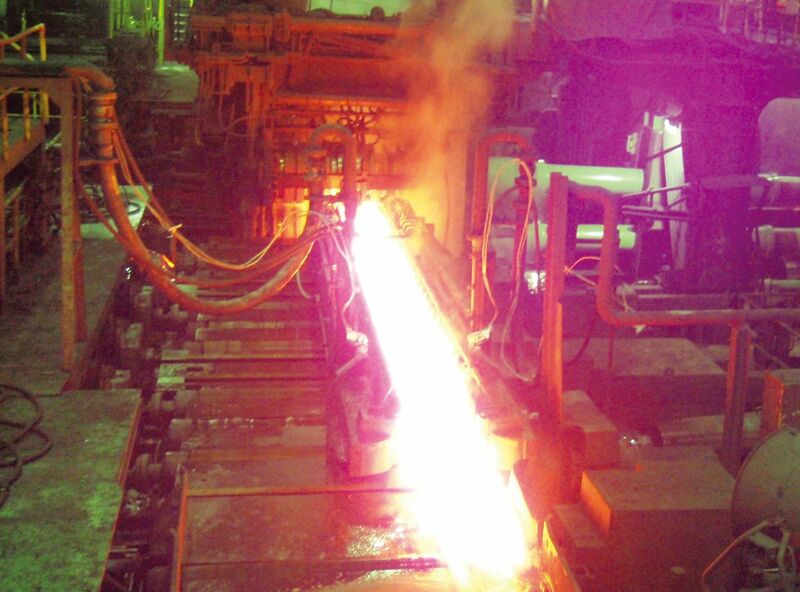 Revamping as necessary can also boost the capabilities of your rolling mills. The precision of the measurements of the shaped steel being manufactured can be enhanced through the combination of a high-rigidity mill, various roll chock locking devices, roll position adjustment functions and optional functions. 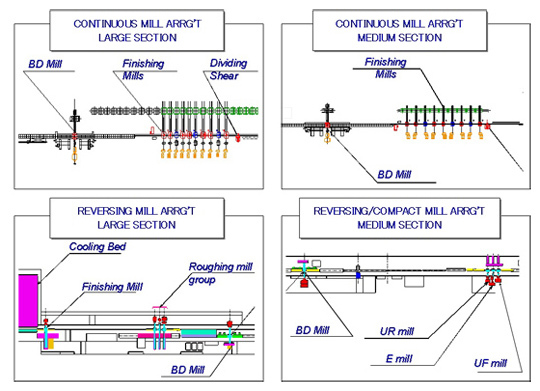 Highly productive rolling can be carried out by setting up as many rolling mills (2Hi mills or universal rolling mills) in a straight line as there are rolling passes for non-reversible rolling. It is a method that is often applied for rolling small to medium-sized shaped steel.The predominant style is the stand-exchanging method through which the roll is exchanged in its stand. This is a rolling method in which two or three universal rolling mills and 2Hi rolling mills are combined to manufacture the shaped steel. Although production efficiency declines, it allows for efficient use of space through the compact layout of the production line. This is a device for universal rolling mills that allows the yoke to swing open on the roll exchange side for faster roll changes. It contributes to the shortening of roll exchange times. In shaped steel of the past, the adjustment of roll gaps was usually carried out through the electric screw-down method . However, with the higher demand in recent years in terms of size tolerance, the need to control roll gaps even more closely began to arise. 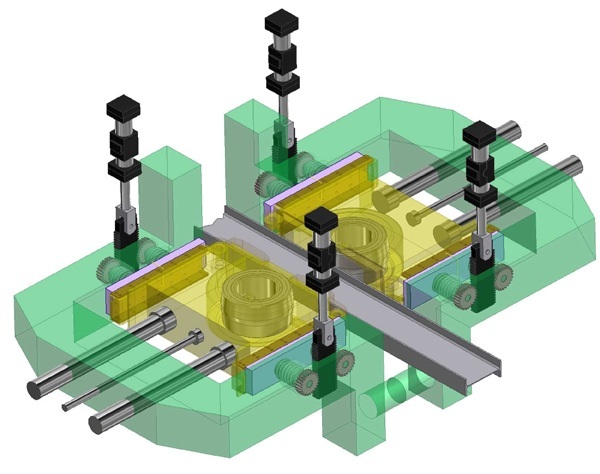 Theoretically speaking, hydraulic roll gap control allows the mill modulus to be infinite. By combining it with a profile meter for automatic hydraulic roll gap control, this device will contribute to improving the precision of the shaped steel measurements. 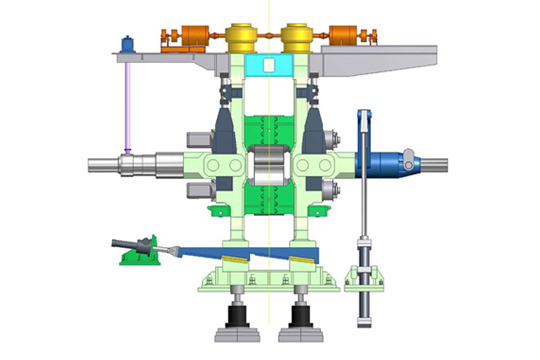 In the case of universal rolling mills, there is a need to always guide non-rolled materials through the center of the stand. In the past, the material was guided to the center of the stand by lowering or raising the head and tail ends of the rolling mill. However, this had an adverse effect on shaped steel measurements because the materials go into the roll bite while going up and down the slope. With this device, it is possible to maintain the table height in a horizontal position and adjust the height of the stand to center it. This allows non-rolled materials to be continually guided horizontally into the roll bite. 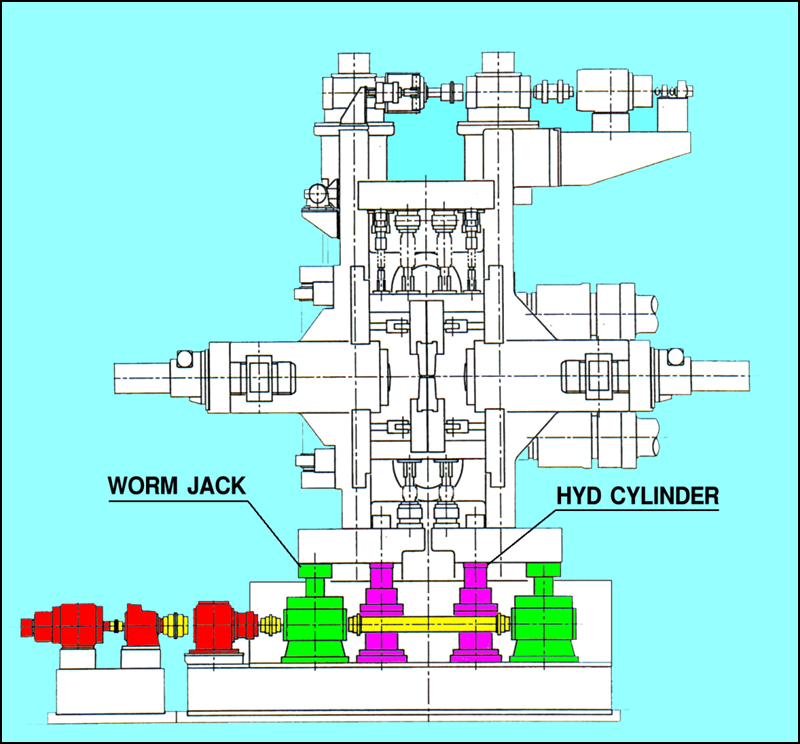 Vertical rolls are ordinarily not driven on a universal rolling mill. Therefore, when trying to apply strong pressure to the flange thickness to make H-shaped steel, etc., if the material comes into contact with the vertical roll first, it increases the possibility of faulty roll bites. This device offsets the center of the vertical roll to the downstream side of the rolling direction relative to the center of the horizontal roll, thereby reducing the chance of the materials hitting the vertical roll strongly first. It makes it possible for the flange to apply strong pressure and contributes to higher production efficiency. 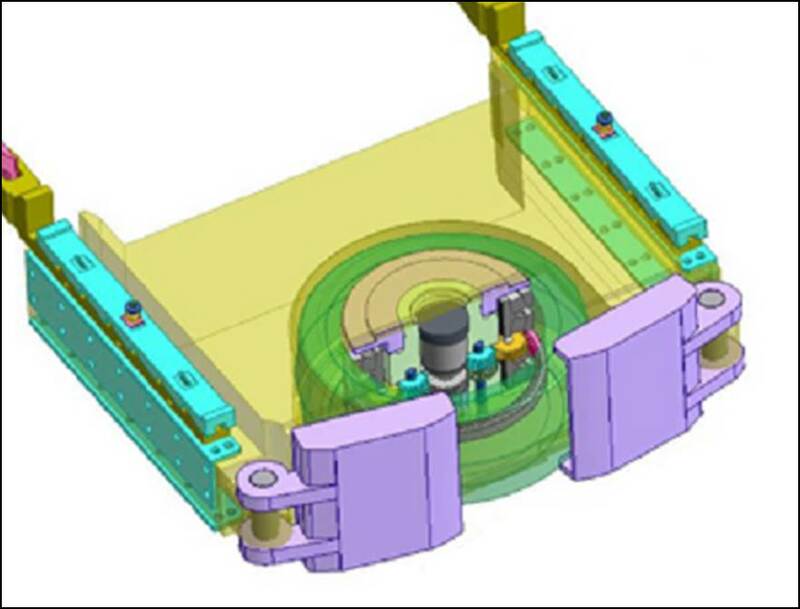 With a universal rolling mill, when being applied primarily at the finishing stage of shaping, if the rolling speed is fast and the amount of pressure under the flange is not that big, there is slipping that occurs between the material and the vertical roll before the material undergoing rolling bites into the roll, and the vertical roll synchronizes with the rolling speed and begins turning. This slipping appears as slippage scratches on the flange surface. This device accelerates the vertical roll to a steady rolling speed before the material bites into the roll, thereby suppressing slipping and the scratching of the product surface.